There is no place in American to visit like the city of Houston, Texas. The city is filled with a rich and historical past and it really lives up to the every thing is larger in Texas lifestyle. When it comes to finding a restaurant to visit during your trip there is no better place then the Hard Rock Cafe to get a serving of some rock n roll music and a great steak or burger at the same time. 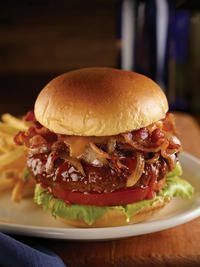 The Hard Rock Cafe located at 502 Texas St, Houston, TX 77002 is a great place place to get a great burger or steak during your visit to the lone star state. As always visitors are greeted by a beautiful restaurant that looks like something out of a rock n roll music video. There is plenty of memorabilia and although the place is huge the noise level is actually moderate so you can have family or friends come out with you for drinks and a great bite to eat. Hard Rock Cafe veterans will appreciate how the location has kept to the core values of the brand, and they ensure that all patrons will have a stellar dining experience. Guests will be greeted to a friendly and knowledgeable staff, and you might even get some lessons on rock n roll history. The Houston Hard Rock Cafe has been home to many great stars, including the legendary Slash and Gene Simmons. With an everything is bigger in Texas philosophy and a menu that will leave you singing in high notes the Hard Rock Cafe is definitely a worth while stop on your rock n roll adventure.